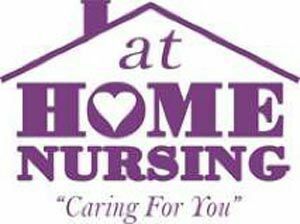 At Home Nursing provides Personal Care Attendants for persons needing assistance so they can remain safely at home. The agency is locally owned and managed by a Nurse/Nurse Practitioner and has been in business since 1998. At Home Nursing is certified by CAHSAH (California Association for Health Services at Home) as a Home Care Aide organization. As a long time member of CAHSAH, our State Home Care Association, and active member on State committees, our agency fully supports some basic standards of care and worked with CAHSAH to develop their certification program. One of few agencies in Sonoma County certified by CAHSAH, we will continue to strive to hire quality caregivers that provide care that exceeds our client`s expections. All of our staff are hired as employees and are screened, interviewed, skills tested, reference checked, bonded and insured, as well as covered by Worker`s Comp and professional liability insurances. Our caregiving staff are all supervised by both nurses and a senior caregiver on a consistent basis to ensure the quality of their work. We provide a Free In Home assessment by a nurse to meet the client and family and to determine level of care needed. We are then able to match personalities and skill level of our clients to our caregivers. Our Nurse Care Managers maintain the clients and supervise the caregivers on an ongoing basis. Our Nurse Managers are On Call 24/7 for management and support of all cases and caregivers. There are No Minimum hours for care required. Our home care aides are skilled in providing all activities of daily living and personal care, assist with medication reminders, provide companionship, assist with exercise programs, can do shopping, meal preparation, driving, errands, and light housekeeping. We provide care by the hour, Sleep Shifts, 12 hour shifts (at no overtime) and Live-Ins. Our company is contracted with such Sonoma County agencies as MSSP, IHSS, Council on Aging, APS, various Hospices and with the Veteran`s Administration. We have an on-site office at Brookdale Senior Living`s Lodge at Paulin Creek, where we provide task level services in addition to our levels of care and work at Oakmont Gardens. At Home Nursing Services is our other corporation and is a State licensed Home Health Agency, which allows us to provide Medication Management and Reconciliation, skilled nursing services and Geriatric Nurse Case Management. In addition, because of our owner`s pediatric expertise, we service the pediatric population in our community. Our owner, Diane Brabetz, RN CPNP PHN, a graduate of Johns Hopkins Hospital School of Nursing, is actively involved in the community. She has worked tirelessly over the years to bring home care services to Sonoma County and be a leader in the field. She believes strongly in the advantages a nurse model Home Care Agency brings to the clients she serves.